The new edition of this highly popular book is an indispensable guide to daily procedures and problems for nurses starting work on the ward or returning to practice. It provides guidance in a variety of areas including: how to organise your job and yourself; how to assess patients; clinical information on a wide range of conditions; important principles, procedures and investigations; how to administer drugs safely; and what to do in an emergency. As well as information on how to do the job, the importance of communication and nursing care issues is emphasised. Background information is also given on underlying legal, health and safety issues. "The highlights of this book are its comprehensive contents; and the manner in which subjects are covered, specifically the systematic approach to managing patient care...The strength is the sheer volume of information covered by the authors. It is comprehensive in the data provided. It has expanded from previous editions to include issues related to professional practice for nurses. Being revised, it is up to date and this is seen through the inclusion of the current resuscitation guidelines." "This guide is a useful 'friend and companion' to keep close at hand. 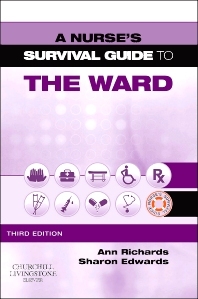 It is an essential reference for nurses, not only on the ward but in every field of practice where patient care is given. In fact, it makes an accessible guide for all healthcare practitioners...The text is presented in clear and concise slices that could make learning a piece of cake...The book is so practical that it even comes with a waterproof, wipeable and durable cover. I recommend this guide as an invaluable resource for nurses from day on of their training an throughout their nursing career." "The guide would be an excellent resource in many situations. It would be of obvious benefit for nursing students or newly registered nurses and allied healthcare professionals, but also for nurses or members of multidisciplinary teams whose specialist roles many have taken them away providing care in acute settings. The information is easy to follow and so can provide a good prompt for exam revision or to provide a basic update before a placement. It also allows readers to generate questions that can be discuessed with senior colleagues to provide a holistic approach to providing care."